A new study has shown that adding ascorbic acid and sugar to green tea can help the body easily absorb helpful compounds that help fight health problems. Mario Ferruzzi, lead researcher and associate professor of food science and nutrition at Purdue University, insists that adding ascorbic acid to green tea would increase the absorbability of catechins found in the tea. Catechins, a class of polyphenols common in tea, cocoa and grape, are antioxidants thought to fight heart disease, stroke, cancer, diabetes and other health problems. 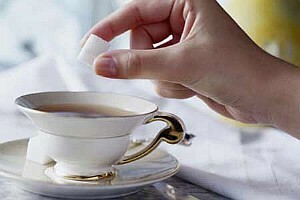 Ascorbic acid, sucrose or both together increase by as much as three times the amount of catechins that can be absorbed into the bloodstream. According to Ferruzzi, Elsa Janle, a Purdue associate research professor of foods and nutrition, and Catrina Peters, the new study also demonstrates the effectiveness of a model that could reduce the number of animals needed for these types of studies. The model charts how the digestive stability, solubility and absorption of polyphenols changes based on modifications to a beverage’s formula. Ferruzzi said testing with the model could allow researchers to predict how a new product formula might change the product”s properties, reducing the number of animals needed for testing to only products that showed desired characteristics in the model. The study backed up the model study that showed adding sugar and vitamin C to green tea enhanced the body’s ability to absorb polyphenols. Ferruzzi said that adding lemon juice or other citrus juice to tea would do the trick, or consumers could look for ready-to-drink products that contain 100 percent of the recommended amount of vitamin C or ascorbic acid on the ingredient list. The study appears in journal Food Research International. WHO KNEW CRISTIANO RONALDO WAS A HUGE J.LO FAN!